Yes, Virginia, there’s another tournament in town. The University of Virginia Cavaliers may have won the NCAA Men’s Basketball Tournament, but here at National Today News, the March “Gladness” crown has gone to the dogs. Throughout the month, we displayed an NCAA-type bracket designed to uncover America’s favorite quirky holiday. 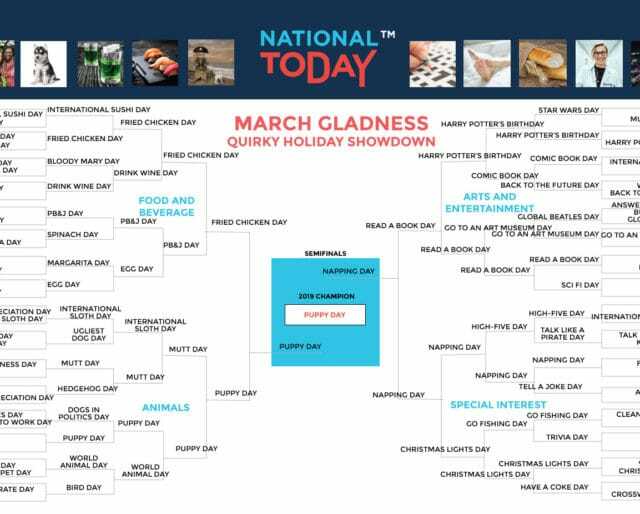 Here’s what we learned: In the end, National Fried Chicken Day won the food and beverage conference, while National Puppy Day conquered the animal conference with cuteness. Americans’ favorite cultural holiday is National Read a Book Day, and National Napping Day is the most special. Check out our bracket above to see how your favorite holidays fared. Thanks to all who participated, and we hope to have made your March a little bit more glad.